The Kramer 8 series of wheel loaders and telescopic wheel loaders are setting new standards in terms of technology, performance and comfort. As well as their high levels of stability, the 8 series features a constant payload at any steering angle, plus a powerful engine. It’s especially spacious panoramic cabin (2.3 m³) ensures superior driver comfort and excellent all-round visibility. 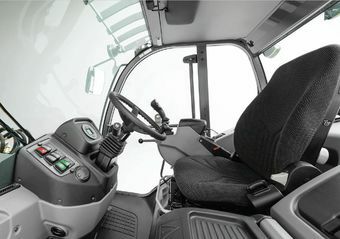 Comfort cab with an entry from both sides as well as extensive glazing for the best all-round visibility and fatigue-free working. The cab comfort is completed with a flexible steering wheel and seat adjustment as well as their ergonomic design. Both contribute to a fatigue-free working over many hours. 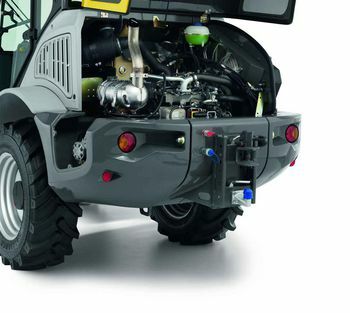 With the engines from Kramer wheel loaders and tele-wheel loaders you are well prepared for the strict exhaust emission standards of the future. The 8-series engines comply with the current exhaust emission standards IV and V. The wheel loaders are equipped as standard with 55 kW and with diesel oxidation catalytic converter (DOC) and diesel particulate filter (DPF) - this enables reliable operation in any situation (exhaust emission level V). In addition, the new engines deliver full power despite low revs and a high increase in torque. For the larger models, we offer an optional 74 kW (100 PS) engine with DOC and SCR technology (exhaust stage IV). SCR (selective catalytic reduction) significantly reduces the proportion of nitrogen oxides. The 8155/8155L wheel loader is powered by a 100 kW Deutz TCD 3.6 engine with exhaust stage IV emissions. Exhaust aftertreatment is performed by DOC and SCR (optional DPF). The even more powerful Deutz TCD 4.1 with 115 kW is also available as an option. Exhaust aftertreatment using DOC, DPF and SCR is standard here. Tractor approval is a plus point. The trailer coupling in conjunction with a tractor approval (both optional) makes every wheel loader and telescopic wheel loader the perfect towing vehicle. In this way, you can transport work machines, tools, building materials and attachments on site – even on public roads. This saves you valuable time and therefore also costs. * The regulations and laws of the relevant countries and regions are to be met. Ideal for a wide range of applications: The height of the trailer coupling can be adjusted. Sensitive control. Tackle jobs powerfully. The work hydraulics and drive system are optimally coordinated with each other. Powerflow was designed and developed for special attachments with an increased power requirement, such as mulchers or snow blower protection. Powerflow is optionally available and offers extra power potential. Quick on the road. Precise application. A powerful drive system plus sophisticated safety and comfort functions — with this combination, Kramer wheel loaders and telescopic wheel loaders score when on the move. Variable high speed gearboxes also developed by Kramer provide particularly reliable services here: ecospeed and ecospeedPRO (optional). Via an electronic control module, the transmission is automatically adapted to the respective load condition of the machine. So you can always rely on maximum pushing power, even with a simultaneously lower engine speed. For variable accelerations from 0 to 40 km/h. Top performance of the drive system. A variety of tasks. Always the right attachments. Make your wheel loader and telescopic wheel loader into a useful all-rounder year-round: with our wide diversified range of attachments. This is not only practical, but also economical.